Hotel de Sens was built between 1474-1519 as a residence for Tristan de Salazar, the archbishop of Sens. 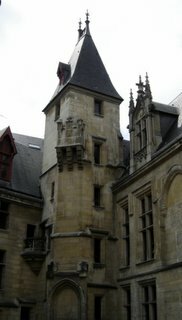 It is one of the very few medieval residences still standing in Paris. 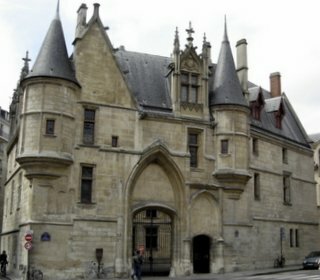 Another is the Hôtel de Cluny, at 6 Place Paul Painlevé in the 5th arrondissement, now the home of the Museum of the Middle Ages. The architecture of Hotel de Sens features elements of defense. There are turrets built for surveillance; a square tower served as a dungeon; the arched entryway has chutes built into it enabling defenders to pour boiling water on invaders. In 1605, Queen Margot was sent to live here by her husband, Henri IV. During 1689-1743, it became the, "Siege de Messageries, Coches and Carroisses de Lyon, Bourgogne et Franche Comté", which means, the Seat of Parcel Delivery Service Coaches and Carriages of Lyon, Bobgogne and the Franch Comté". In other words, it was a stage coach office. Later, it again became the residence of the Archbishops of Paris, until the Revolution. Then, it was occupied by art students and was later used as a jam factory. In 1883, the Council of Paris decided to create a library specializing in art and art techniques. The Council wished to create a place where people could draw, use models and borrow books. It was at this time that Samuel Fornay, an industrialist, donated to the City 200,000 francs to be used for the education of young artists. It is in honor of this man that the Bibliothèque Fornay gets its name. In 1886, the Bibliothèque Fornay was established at 12 rue Titon, in the 11th arrondissement. Very quickly artists, bronze workers and architects were frequenting the library. It wasn't until 1929 that the Council of Paris decided to move the Bibliotheque to the Hotel de Sens. From 1939-1961, the Hotel de Sens underwent restoration. In 1961, the Bibliothèque Fornay was established in the Hôtel de Sens. The library now has a collection of 200,000 books, 2,580 periodicals, 23,000 posters, 1,110,000 postcards, 325,000 reproductions, 28,000 commercial catalogues and 50,000 slides. The Hôtel often holds temporary exhibits. The usual entrance fees to these exhibits are 4 euros for adults, 2 euros for persons over 60 years of age, for students under 26 years of age, for teachers, librarians and for groups of 10 people or more. Admission to the exhibits are free for those under 14 years of age. The courtyard and the library are open to the public Tuesday-Friday from 1:30 p.m.-8:30 p.m., and on Saturday from 10 a.m.-8:30 p.m. It is closed on Sunday and Monday. It is also closed between June 29-July 19.